that is sure to become the standard for pro digital SLR housings. Consult a SEA&SEA authorized service center for more compatibility information. Customizing the housing offers additional functions. You can replace the 5-pin wired YS converter connector on the top of the housing with a 2-pin wired strobe connector for an additional cost. This modification provides two 2-pin wired strobe connectors so you can connect two SEA&SEA YS-Series strobes. *This modification does not support automatic TTL flash adjustment. *It requires the 5-pin Sync Cord/N. By attachment of a 45° viewfinder (view magnification of 1.2x) with Amici prisms to the By attaching the VF180 1.2x or the VF45 1.2x prism viewfinder (magnification ratio of 1.2x) to a SEA&SEA housing, the magnification increases by 1.2x and entire field of view can be seen at the same time. Recommended for users committed to strict composition and focusing. * Factory modification is required to install the viewfinder. Contact an official SEA&SEA dealer or distributor. Designed for easy operation so you can comfortably reach the main command dial and sub-command dial with your fingers, while keeping your hands on the grips. Delicate operations are possible even while you are looking through the viewfinder. The larger diameter of frequently-used dials allows you to change the shutter speed or aperture value with a light touch while supporting the framing. This frees you, the photographer, to concentrate only on the perfect chance for a great picture. The included type-N 5-pin wired connector accepts the optional YS Converter/N. The converter works with the YS-Series strobes to provide automatic TTL flash adjustment. *The converter requires the 5-pin Sync Cord/N for connecting to a strobe. 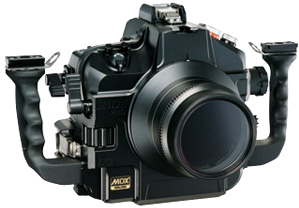 *The MDX-PRO D3 housing comes from the factory with these type-N connectors: one 2-pin wired connector and one 5-pin wired connector. *To use two SEA&SEA YS-Series strobes with the factory-equipped type-N connectors, you must use the 5-pin Dual Sync Cord/N. Every detail of the housing is precision machined from a solid aluminum block to achieve a high-quality texture and design. All edges have been polished carefully for safety. Manufactured from solid block aluminum alloy with all edges carefully polished for safety. The housing is protected by a highly corrosion resistant anodized (black) coating. The coating protects the housing from environmental corrosion and abrasions. Comes standard with two kinds of type-N connectors: one 2-pin wired connector (for manual) and one 5-pin wired connector (for dedicated TTL). Equipped with a Optical Viewfinder 0.66x standard. Interchangeable 0.5x/0.8x viewfinders (optional) are also available. A port lock mechanism secures the port from accidental loosening. A built-in leak sensor immediately alerts you to any water leakage.